‘Forget Mary’s challenge and just do the showstopper’, one of my sisters wrote on my Facebook page the day after The Great British Bake Off this week. To be honest showing off my baking skills was not top of my to do list in the past few days and this is why my post is a few days late. It has been a week of sad news for people around me as well as plenty of tragedy in the news. Sometimes it’s possible to carry on as normal, but sometimes a pause is needed. Talking about baking seemed a little trivial, even disrespectful, when grief is touching a friend’s life and countless others are suffering terrible injustice, but I’ll leave discussion on the latter for another post. As I was baking this week I was considering these things, praying about all these things – I do a lot of thinking and praying while I bake. A challenge is a challenge though. This week’s Bake Off was biscuits (that’s cookies to my North American friends). British biscuits should snap and have a bit of crunch to them, maybe some chewiness now and again, but the snap is very important when it comes to the Great British Bake Off. The bakers made savoury biscuits for cheese first, then the technical challenge was to make Florentines and then the showstoppers were 3D biscuit structures – think pirate scene, snow-covered mountains and lodges, George and the Dragon, a train, a fairground – there were some pretty impressive ideas and creations. To be honest I would have loved to be able to do my own version, I have an idea in my head of what I would do (and I’m not telling), but the time to do it was not there this week. I’ll save that for another time. 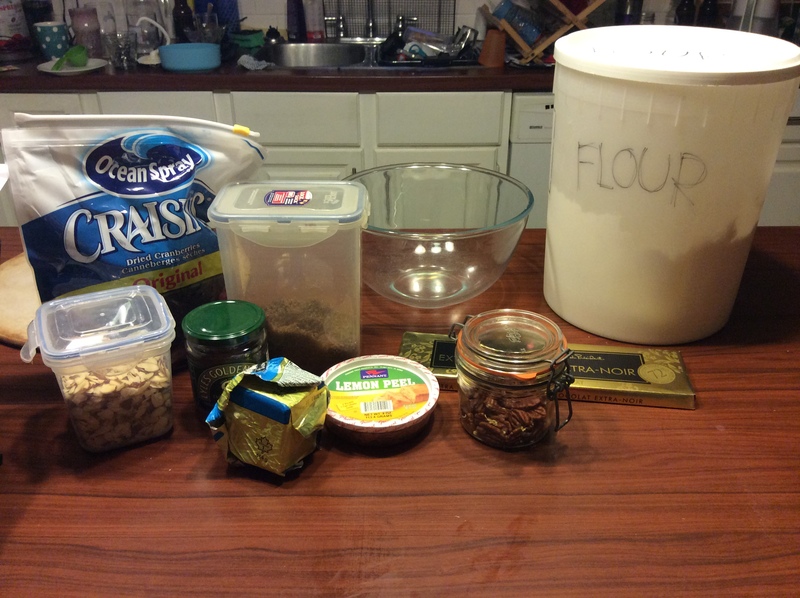 Amazingly all the ingredients for Florentines were in my kitchen cupboards. 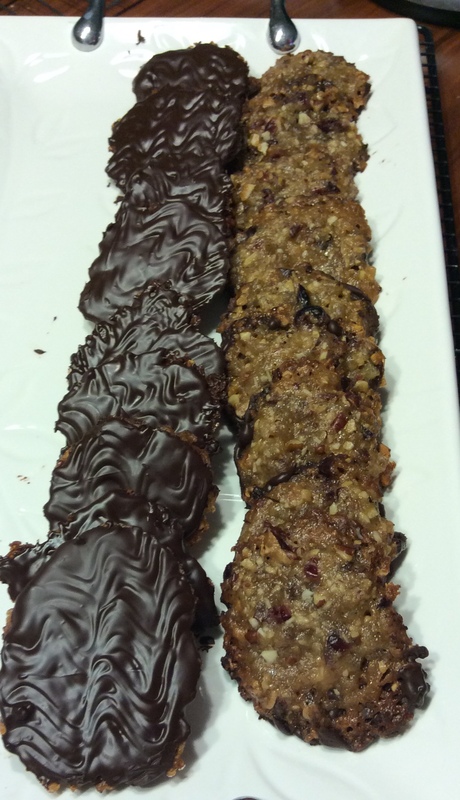 Florentines are caramelly fruit and nut biscuits iced on the bottom with dark chocolate. Posh biscuits. Though they are rumoured to be Italian in origin they are in fact a French creation, I believe. The recipe calls for walnuts as well as almonds, but I used pecans as a) I don’t like walnuts and b) I had pecans in the cupboard. I reckoned that the one and a quarter hours the bakers were given was enough – and as I was waiting for bread to rise it was a perfect time to make them. Melt the butter, sugar and syrup together, stir in the rest of the ingredients, spoon teaspoonfuls onto lined baking trays and bake. That part was simple if a bit sticky. Tempering chocolate, not so simple. I do not own a sugar thermometer so had to do some guesswork on melting temperature and such. I think I got the chocolate too hot as it took an age to cool and become the right consistency to spread and make the zig zag marks on them. Finally they did cool though and looked something like Mary Berry’s ones – well almost. What is important though is the taste and they tasted good. Chewy and a bit crunchy. Even liked by my most dedicated chocolate chip cookie loving child which is a feat in itself. Job done!